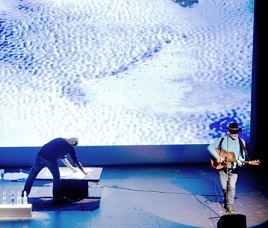 BLUES is a multimedia art project collaboration: a live art performance with artist Fabrizio Simeoni and musician Derek McGowan on stage, accompanied by a video projection by photographer Michael Gannon. Over the course of the performance, Fabrizio Simeoni will realise a new painting with original music from Derek McGowan's solo album Rainlight, which was released last year to critical acclaim. Fabrizio explains: "The performance is based on a fusion between Painting and Music. The paintings are the result of this fusion, the video its narration and the music its sound track. This synthesis is not simply an emotional response to the music, it happens in the technical execution of the painting itself: where the music generates, through sound vibrations, its own design/pattern on the canvas. BLUES allows the viewer to enter the two-dimensional space of the canvas, in a way to experience the sensations that an artist feels during the process of the making, facilitated by the live music." A fascinating and immersive performance originally presented as part of The Acoustic Yard Music Festival in Westport.